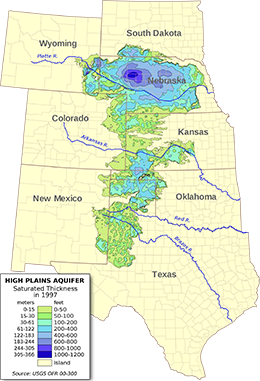 Since 2003, the Ogallala Aquifer Program (OAP) has provided permanent federal funding to a research consortium for numerous research projects on water conservation. The program includes U.S. Department of Agriculture’s Agricultural Research Service (ARS), Kansas State University, Texas A&M AgriLife Research and Extension Service, Texas Tech University and West Texas A&M University. Through the years, the Ogallala Aquifer Program (OAP) has won several awards for its work on improving the sustainability of agricultural industries and rural communities in the region through innovative scientific research and technology transfer. Grain sorghum production is highly susceptible to changes in climatic conditions, more so than to different irrigation regiments a producer might implement on the crop, according to a Texas A&M AgriLife Research modeling study. The results of the study, “Simulation of eﬃcient irrigation management strategies for grain sorghum production over diﬀerent climate variability classes,” were recently published in Agricultural Systems journal. The Texas Water Resources Institute recently published the Fall 2018 issue of its magazine, txH2O, highlighting the range of research activities across the Ogallala Aquifer region, including the Ogallala Water Coordinated Agricultural Project and the Ogallala Aquifer Program. Staff writers interviewed researchers from the Ogallala Water Coordinated Agricultural Project and the Ogallala Aquifer Program, two large research efforts supported by the U.S. Department of Agriculture. Other articles include topics about 21st century irrigation tools, celebrating 40 years of low pressure center pivot irrigation and how researchers are helping farmers conserve water with field day events. Read more.